For the first time ever, MOMAR moved to Burnaby this year. It was an exciting change after several (very good mind you) years at Squamish, a new venue is always welcome. I had mountain biked on a few of the trails on the mountain in the past, but didn't know the full extent of the trails available. I also heard that also for the first time, two true orienteering maps would be used, which was pretty cool. Originally, I had planned to race with my normal racing partner, Garth Campbell, but it turned out that he had other obligations that day and couldn't make it. 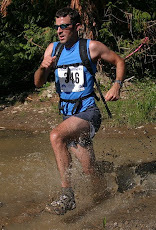 That left me to attempt a solo effort which I had only done once before (Squamish 2009). The difference this time was that there was a kayak stage which I knew would be un-enjoyable for me. 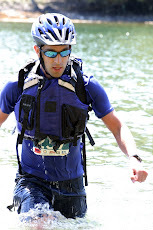 Of course, the main problem is that I only ever kayak during these races and lack both proper technique and sufficient upper body strength and endurance to be competitive. In any case, I hoped to be just survive the kayak and then race fast and smart for the remaining stages to pull myself up through the field. Weather forecasts prior to the race threatened rain, but race day turned out to be overcast and cool, but dry - perfect for racing. I arrived with Sonja (who was volunteering) a little over an hour before race time. This gave me just enough time to drop my mountain bike at transition, fit my rental kayak, look at the map which was handed out, make sure I had everything in my pack, etc. It is always amazing how fast an hour goes by in that environment. My cardio system was not particularly taxed, but I knew that my shoulders and arms would not take it if I pushed too hard. In addition, I had decided before even getting on the water that there was little reason to kill myself on the kayak. If I went all out, I could perhaps shave a few minutes off my kayak time, but it would take a lot out of me. Better to stay steady and use that extra energy where I could make it count more on the bike and running sections coming up. I didn't know exactly how long the paddle would be, but usually they are around 10 km, which Garth and I normally finish in about an hour. I figured I'd be 10 min off that mark so kind of had that in my mind going in. The stage was an out and back in Burrard Inlet, so I knew that once Bart came back the other way, I would have an idea of where the turnaround was. Unfortunately, I didn't see him until 30 min in which meant that it was still a ways before I would get to the turn-around. Eventually it came 40 min in, and I started the long trip back. Because I was staying in control, I wasn't suffering that badly, but just really wanted to be be done (plus the muscles were getting tired). Finally, the beach came after about 1:20 on the water and I rushed off to grab my bike for the second stage. What a relief to be on two wheels! This stage brought us west on some trails and roads, crossed the highway (where I had to wait briefly for the light), though a few residential streets, and then onto the Trans-Canada Trail (TCT) for the accent up to Simon Fraser University at the top of Burnaby Mountain. I lost myself a couple of minutes by making a navigational error on the streets. I kicked myself a bit since it was mostly because I wasn't paying enough attention, but the damage was done so I moved on. The climb on the TCT was tough, but I managed to ride it and pass quite a few teams in the process (since I was about 3/4 the way back after the paddle I had a lot of time to make up). My legs were feeling reasonable although not amazing, but as long as I could keep going at a steady pace, I'd be OK.
At the top, we had a quick gear check (whistle and space blanket). My check went quickly as I had both items visible in the mesh pouch of my pack so I didn't even have to remove it to show the volunteer. This is an easy way to pick up a minute or two as I noticed a good number of racers rummaging around it their packs for the items. I passed Jen Segger who was racing with a team of 4. As always, she is super positive and encouraged me to go catch the leaders. Sonja was directly some traffic near the Orienteering stage start so I said hi as I biked passed. For the first time ever at a MOMAR, the O course was using electronic timing (you carry a electronic key that you insert into a reader at each control). This was nice, as it allows you to see how you did at between each control after the race and it is a bit quicker to use than a traditional punch. I elected to pick the checkpoints in clockwise order although either direction would likley have been about the same speed. Navigation was pretty straight forward as there were a lot of features to position yourself with since it was largely urban. I did one bushwhack with another solo racer that probably didn't pay off since the vegetation was somewhat thick and included nasty blackberries. Overall though, I was able to find most of the checkpoints with a minimal amount of wasted time. Some of the checkpoints on the campus itself were a bit tricky as there are many floors which is not easy to see on a 2D map. Overall, though I finished fairly strong with a time of 32:21, good for the 2nd fastest O stage, only 13s behind Todd Nowack. Then I was onto the bike, pulling out just behind Hayden Earle and Scott Sheldrake. They are both quite competent mountain bikers and I was not able to make any time up on them on downhill sections. The downhill and cross country was fun although I was a bit rusty since I have done a minimal amount of mountain biking since the last MOMAR. I found it to rough in many sections, but not very steep for the most part and I was able to ride nearly all of it comfortably. A the bottom of the hill, Hayden and Scott arrived just ahead of me at checkpoint 9 where I was finally able to pass them as they were refueling at the water station there. After that, came the 2nd climb of the day up to the top of the mountain. It started out fairly gradually on a power line trail, but then got much steeper once it moved onto another section of the TCT. Finally, it went vertical on the aptly named "Cardiac Hill." I was just able to ride it in granny gear, but it was a struggle. Fortunately, it didn't last too long, and I was on the top again and flying down the side of the road. Then I was onto more downhill single track before heading into the transition area for the trekking stage. I knew that this stage was one that would favour me. The navigation was straight forward, but the route included a significant climb and what looked to be a technical decent so it played to two of my strengths. My legs were definitely not fresh, but despite this, I was able to hold a solid pace on the climb along side the main road. It got a bit steeper as the route moved onto a service road and steeper still when it went onto a trail. It had been a while since I had seen anyone on the course, but I soon spotted Roger MacLeod up ahead. He was power hiking and looking a little spent. He told me that Norm Thibault was not far ahead just a little bit in front of the first team of 2 who I could just see nearing the top of the climb. I thanked him and pushed on ahead, determined to make up as much time on this stage as possible. As soon as the climb was over, I picked up my pace and started to hammer the downhill. Before too long, I spotted the team of two (Mike Conway and Dave Viitakangas) who were moving well on the technical downhill. I was able to reel them in, however, and soon passed the guy in back (I'm not sure which was which). 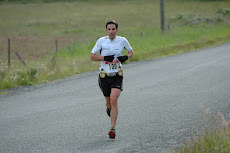 The guy in front was the stronger technical runner though and was really pushing hard to stay ahead. I could tell he was reluctant to let me by, but after a minute or two, I politely asked to get by and he let me go. Soon after that, I caught up to Norm, and said hi as I passed and after a couple more minutes I was back on the bike for the last stage. I had managed to do the navigation stage in 18:12, gaining over 5 min on the next place team. It was then back onto the bike for the final bike stage. It traversed part of the same climb as the 2nd bike climb, but thankfully not "Cardiac Hill" again. I make a minor navigation error which allowed Norm to catch back up. Then a made classic newbie error and ended up following him instead of taking the what I suspected was the correct route. The trail we took ended up getting more and more indistinct and soon we were bush whacking our way through a gully. We were close to the road by this time though and I figured it was faster to struggle though a bit more rather than back track. Luckily, I don't think we lost too much time and were soon back on the proper trail. I trailed just behind Norm while we picked up a couple more check points with no issues. We found out from Marshall's that the last two check points has be cut due to time constraints. Therefore when we arrived at the bike park, it was time to drop our bikes (after riding a few jumps) and head out to the last O stage. Norm and I found the first control together and then I moved on ahead to grab the next. On my way there, I was surprised to see Bart moving slowly in the same direction - he looked to be hurting for sure. I expected him to still be far ahead - it was a navigation stage though so it was difficult to know exactly where he was headed. I got the next control and was just about to head toward what I though was the most logical control when I noticed that Bart was heading in a direction where there seemed to be no controls. This of course made me question myself and warranted another look a the map. Sure enough, upon closer inspection, there was one control way off to one end...actually off the map itself on the margin! How evil! Bart had apparently missed it and was coming back to get it - I would likely have missed it as well. My legs were feeling fatigued, but I was able to muster up a decent run toward this far control. On the way back I was surprised to see Todd heading back from the checkpoint. Due to a back injury Todd has pretty much not been mountain biking or running since November, and just days before the MOMAR was deliberating on whether or not even to do it. Like me though, he can't turn down competition easily and knows how to push himself even when barley trained. I picked up the far control and headed off to pick up the 4 remaining ones as quickly as I could. While I didn't know for sure, I suspected that both Todd and Bart would still beat me, but I wanted to make sure I stayed ahead of Norm and any other contenders. 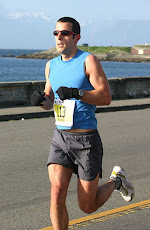 I had a pretty decent kick to the finish to cross in 4:33:55 - good for third place. I was less than 1 min behind Bart and 9 min behind Todd who amazingly still managed to take the win with nearly zero training! Norm came in a few minutes later, and Mike and Dave finished 5th overall to claim the team of two men title. Sarah Seads continued to dominate the solo women with over an hour lead over the next woman. 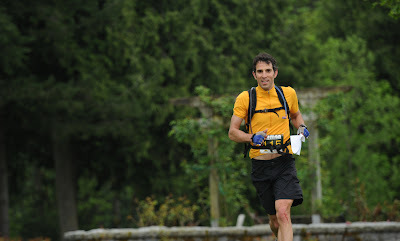 Overall, I was fairly pleased with my race. I made a few navigational errors, noting huge, but together they probably cost me a few minutes. My fitness was good although I didn't feel amazing I felt consistent throughout and could have kept going at a similar pace for a while longer. I do, however, suspect that I could have pushed myself harder on a few sections, as I didn't feel totally spent after crossing the finish line - guess I didn't want it bad enough! Thanks go out to Bryan Tasaka for yet another well run event. Thanks too to course designer, Gary Robbins, who put a fun one together and too all the volunteers. See you all in September for the MOMAR on the island!